Vary based on city. We can help you with the following themes. Contact instructor or promoter. All sales are final. No refunds, no transfers, no exceptions. Fall in Love with the most Sensual Dance on Earth! Foundations Steps, Figures, and Connections in Kizomba! Check-In Time: Arrive 10 to 15 min before class. Do not be late! Course Duration: 3 hours. Every minute counts, we start on time! Break Time: 10 minutes. Snacks and drinks served to students. Registration: Save $10 when you buy before March 31st! Call us or Text "#KizombaDEL" or "KizombaPHL" with your Name and Email to 832-413-2623. Have your credit card ready. Confirmations will be sent via text. The day before the Bootcamp by midnight. You can call the day of the Bootcamp to see if there are any spots available. We only have limited spots available. We keep an even class between guys and ladies. All students must pre-pay prior attending the bootcamp to ensure an even class and the right amount of snacks / drinks. We do not hold unpaid spots. No exceptions. 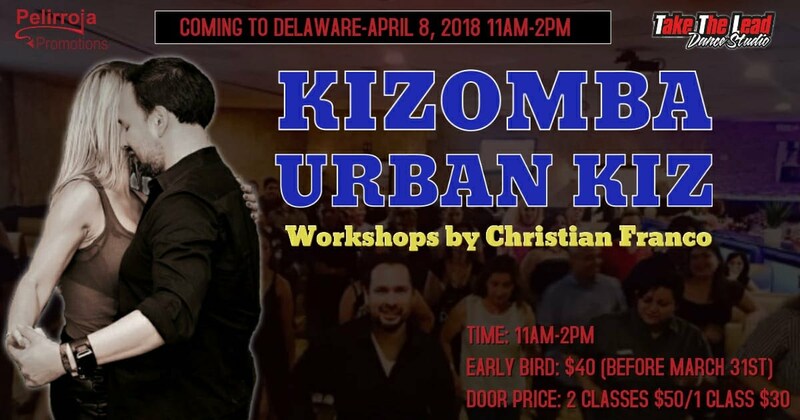 If you still want to do the Kizomba Bootcamp as a Walk-in, it is $50/p (both classes) or $30/p (one class) at the door the day of the Bootcamp - if spots are left. If the class is not even, we may not accept your registration until next time the bootcamp is offered. No exceptions. In the event that all Guy and Ladies spots are gone, please text #KizombaWaitList to 832-413-2623 with name and email. Learning to dance Kizomba in Houston, TX and/or Pearland, TX is not a scary experience. It is actually a lot of fun! We are not there to make you feel silly for not getting it right the first time. We know that everything takes a little time, and also a little laughter to get it just right. If you have signed up, invite your friends to join. They will be glad you did! Our definition of a couple is not restricted to just significant others. So it means if you and your friend or family member want to attend, please register as a couple. It just needs to be a male/female combination. When you register, please include the name of your partner or friend. No walk-ins please. You need to pre-register to help us get a good head count to buy the proper amount of snacks, drinks, to have the right size facility available, and to keep an even men to ladies ratio. No partner necessary (but encouraged). We normally get a 50/50 Male to Female ratio at most of our Bootcamps - So ladies... if you are worried there won't be any men... RELAX! :) PrePayment online or by phone with Credit Card is recommended. All transactions are 100% secure and conducted by PayPal. No partner is required for any of our dance bootcamps. We ask everyone to pre-register so we can even out the class as the days get closer. If we have more ladies, we will look for more guys or viceversa. We usually get 50/50 gender ratio, so do not worry, you will dance with different people. We create a large circle and you start with one partner and then move on to the next and so on. You will make friends fast! Possibly in the future. We visit different cities around the US and the world to introduce Kizomba dance and music to different groups of students. We may return to your city in the near future if interest continues to grow. If I paid for the bootcamp and I can't attend because something came up, what happens to my payment? No! You do not need to know anything. This is a 101 course designed for the absolute beginners, for people that have no clue about how to dance and like to get started. We will train each and everyone one of you to dance from level zero. We will give you little exercises to practice with different people and as the bootcamp progresses we will review and introduce new exercises. At the end you will leave with a nice pattern and also a video of it that you can refer to so you can continue practicing and improving your technique. We will teach you in a stress free, welcoming atmosphere. Everyone that join this bootcamp wants to learn how to dance with style and elegance. No need to feel intimidated! Are you an absolute Kizomba beginner? Are your friends taking Kizomba lessons and you feel left behind? Do you want to find out what Kizomba is all about? Are you too busy during the week and cannot commit to weekly Kizomba classes? Do you know the basic Kizomba steps and want to expand your technique/pattern development? If you answer YES! to any of these, then this is the Bootcamp for YOU! If you are interested in taking privates before or after the bootcamp, feel free to message us. Join our Kizomba Page on Facebook!!! http://www.facebook.com/KizombaHouston - It's FREE - So Join! Now there is NO EXCUSE. You have access to our network of over 20K Kizombeiros and Kizombeiras, see dance videos from international instructors, get dance tips, view fun picture galleries, get inspirational dance quotes, follow our travels and get resources to reach us with any questions that you may have! Join the Group today!!! Get dancing and support the growth of Kizomba in your community! Attend their socials, parties, and events. Share your dance with friends that have not tried Kizomba yet. You can help this dance grow. If you enjoyed our event, please follow us to get into more upcoming bootcamps with us so we can continue furthering your skills into this beautiful dance! Tell your friends about your new discovered dance love! These bootcamps exists because of you and your support! Thank you for sharing these events with your friends and social networks. Christian Franco Gutierrez is a Latin Dance instructor with 4 Kizomba training and formation courses from KizombaFeeling.com (levels 1 and 2; 6 hrs) and Kizomba Kingdom (levels 1, 2, 3, & 4; 9 hrs), and Mestre Petchu Kizomba / Semba Formation Courses (90 hrs) completed in Lisbon Portugal. Christian has further gained more knowledge in Kizomba by attending several International Kizomba Festivals and Congresses featuring Albir and Sara (Spain), Pablo and Julia (Spain), Ivan and Eva (Spain), Ricardo and Paula (Afro Latin Connection, Portugal), Kwenda Lima (Cape Verde), Eddy Vents (London), Ivo Viera and Shani (New York / California), Oscar BA (Maryland), David Campos and Guira Rei (New York), Fred Maestro (France), Morenasso and Anais (France), Felicien and Isa (France), Mestre Petchu and Vanessa (Lisbon), Paulo Cruz (Angola), Helio Santos (Lisbon), Antonio Bandeira (Lisbon), Miguel and Susana (Lisbon), Miguel Monteiro (London), Ruddy and Vie (France), Tamas and Veronika (Italy), Fernando, and Michaela (Italy), Joao (Sweden) Mafalda (Lisbon), Victor and Coralie (Spain), An'So and Nima (France), to name a few. Each instructor has his/her unique flavor and energy. 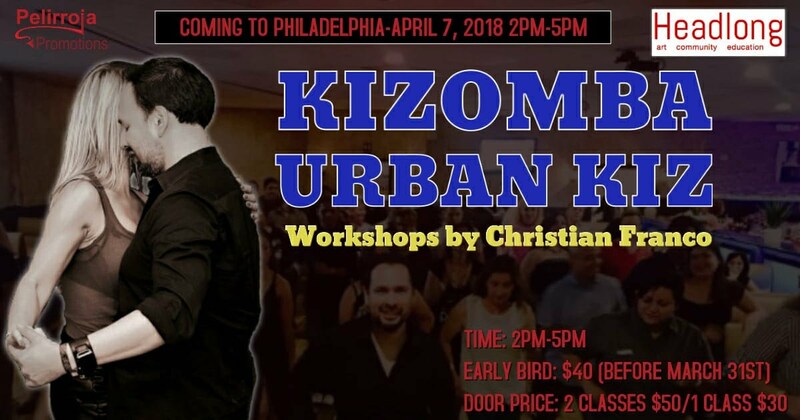 Christian Franco has also brought several international instructors to teach Kizomba in Houston and will be attending more teaching training courses abroad to continue refining his teaching methods and skills. It is an honor to be able to share what life has given me! Dallas, TX - Confirmed Kizomba Beginner and Improver Bootcamps May 24th, 25th with Kizomba Social Party and Kizomba Pool Party. Presented by Miss Kizomba - Araceli Castillo. It is super easy to set up. "If you build it, they will come" Just call us to arrange a date, we will travel to you and help you and your friends learn this beautiful dance. Just help us with a place to crash and we will do the rest! Get notified. Simply Txt your name and email to 832-413-2623 and add Kizomba + "City" and we will send you all the latests details and developments.